What started out has a snowmobile gear company has evolved to be the go-to brand for adventure touring motorcycle gear. Klim has put in the work and is now a household name among riders who dream of dirt. The Klim Badlands Pro has been one of their best known and most popular motorcycle suits. It is the kit that all other adventure touring gear aspires to be. Which is why we are so excited for the newly redesigned Badlands series. The new Klim Badlands Jacket is stacked with updated features that aim to make an already amazing jacket even better. Additional vents have been added on to the chest, bumping the count up to 10, which will help this tank of a jacket wear cooler in the warm weather. The collar can now be secured open by a snap, which is a marked improvement over the velcro solution the previous generation used. A newly designed 3-Layer Gore-tex Pro Shell cuts down on weight while maintaining the same waterproofness and durability that one expects in a jacket like this. Increased protection has also been added to the jacket by the way of Goretex Superfabric on the shoulders, elbows, and forearms, as well as GTX Aramacor on the chest, back, and waist. The jacket will still come standard with a CE Level II rated D30 back protector, CE Level I rated D30 in the shoulders and elbows, and siliconized, non-CE rated chest armor. The new Klim Badlands Pants are constructed with the same newly designed, lighter weight Goretex 3-Layer shell as the jacket. 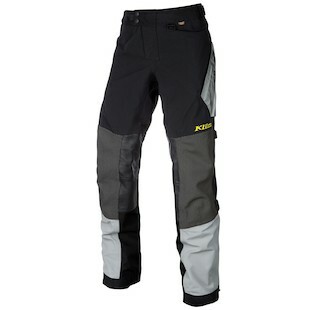 Which should help decrease the weight and increase the comfort of these pants, while maintaining the waterproofness and durability that one needs when touring off road. Protection is increased with Poron XRD tailbone armor, Goretex Armacor on the seat, Goretex Superfabric on the knees and 840D Cordura on the rest of the legs. There are now exterior Velcro cinch straps above and below the knee that will help insure that the D30 knee armor stays where it needs to be, even while being active on the bike off-road. Speaking of D30, the pants will still come standard with CE Level I rated D30 hip and knee protectors. The newly redesigned Badlands Jacket and Pants are setting up to be a home run. 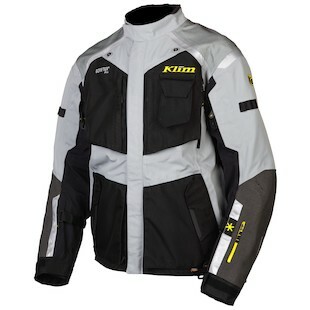 Klim has taken feedback on the previous generation and made some real improvements. Which is not an easy task considering how well the outgoing gear was designed. So if you are looking for an all weather, tough as nails outfit for serious adventure touring, look no further. This is the gear that will take you anywhere you need to go, no matter the weather or terrain.